The policemen escorted by MACC personnel to the magistrate’s chambers yesterday. KOTA KINABALU: Twelve police personnel, including a retiree, were released from their remand over the Malaysian Anti-Corruption Commission (MACC) investigation for alleged bribery involving drug offenders. Magistrate Cindy Mc Juce Balitus made the order on the men aged between 26 and 55 at the request of MACC investigating officer Mohd Faliq Basiruddin, yesterday. 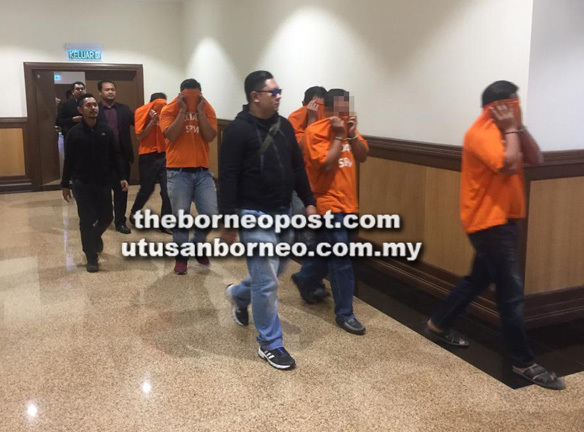 The order was made at the magistrate’s chambers where the men were released on RM10,000 bail each with RM3,000 to be deposited with a local surety and ordered to report once a month to the nearest police station as well as not to tamper with the prosecution witnesses. “All the men were not represented. Previously, 11 men, including the retiree, were brought to the court on Oct 9 and another policeman on Oct 12 where they were remanded for investigation under Section 17 (a) of the Malaysian Anti-Corruption Commission Act 2009. According to Mohd Faliq, the policemen, with the rank of Inspector, Corporal, Lance Corporal and constable, who once served at the Narcotics Division in Kota Belud, were allegedly involved in receiving money monthly, weekly and daily to protect drug offenders. There were several transactions from 2014 to 2018 involving up to thousands in cash, he said, adding that the MACC director would give further information to the media on the matter. The policemen were apprehended in Kota Belud, Beluran and here and brought to the MACC office here to be arrested.